Let your customers create alerts for your out of stock Products / Combinations and send an automatic email once you have stock again. Increase your sales and your customers loyalty with this amazing module. 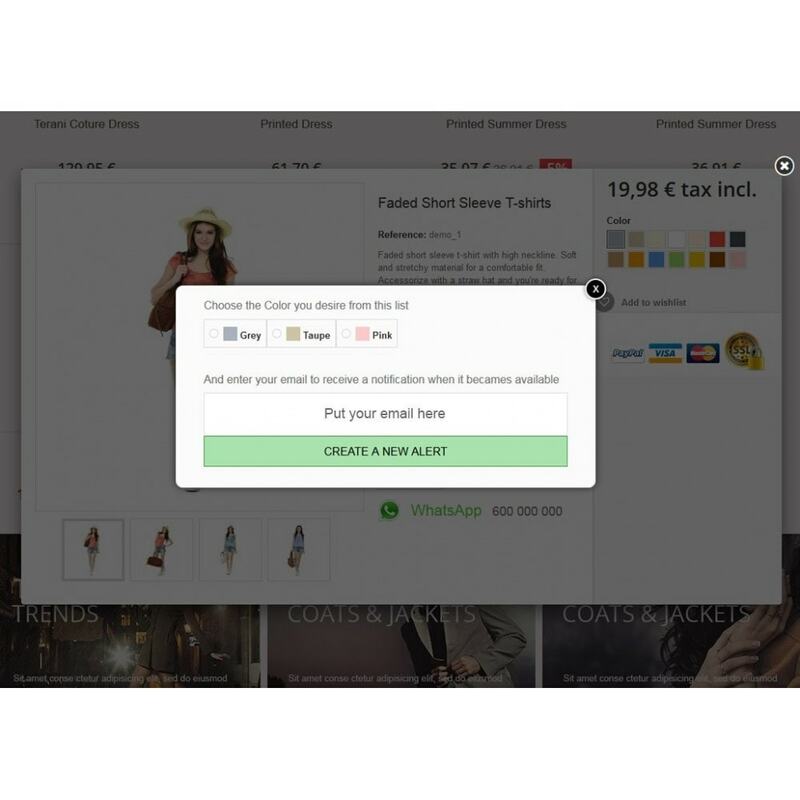 But it can be helpful to any business because it will lets you keep track of what your customers want more, for example if you have a product and it runs out of stock customers will see it and they may leave your page without any action, with this module they can create the alert and wait for restock. How the alerts are created? When a product or a combination is out of stock your customers will see a box inviting them to create an alert for the combination they're missing. Once they click a pop up they will choose a combination and enter their email. Once the customer create the alert he can receive a confirmation email (optional) and the admin can receive a notification too (optional). The admin notification email can be changed. How do I notify my customers when stock is back? 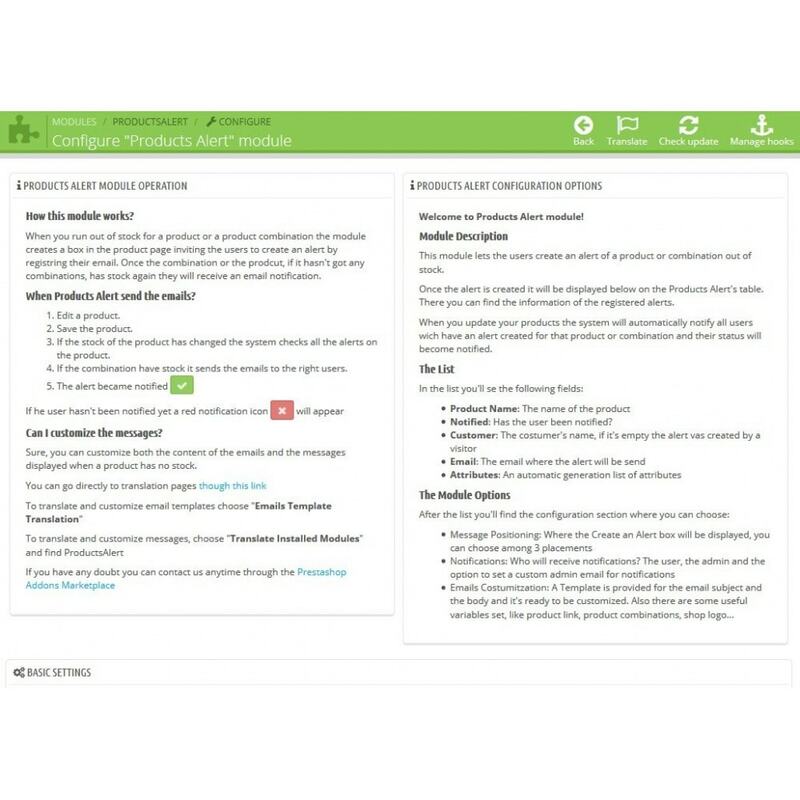 When you edit your product quantities and save the module will check all the active alerts and will send them an email if they have created that alert. What options do I have in the Back Office? 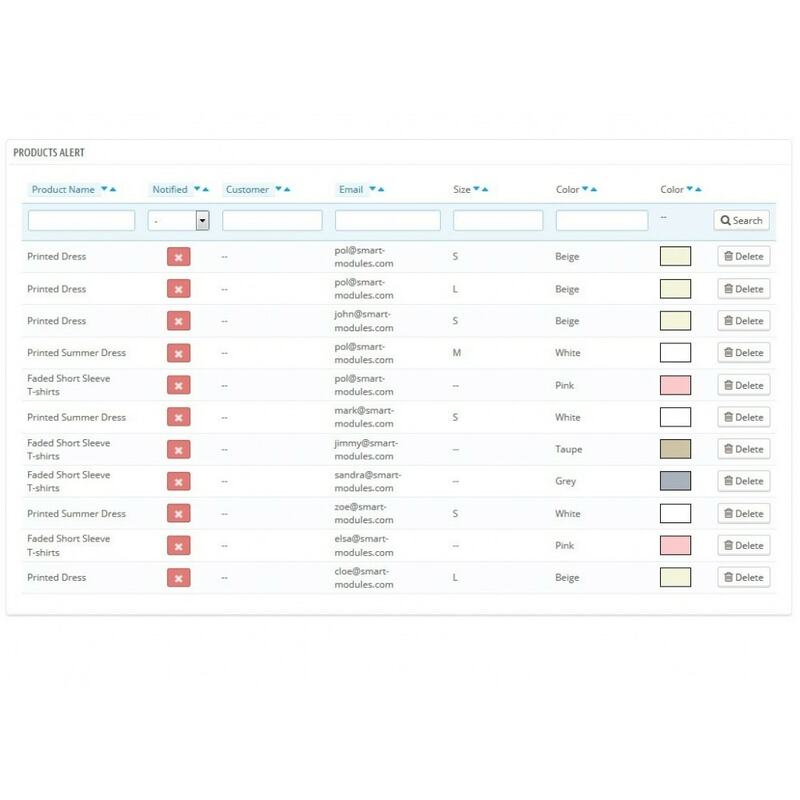 You can configure where to display the alert box, who will receive notifications, an alternative email for admin notifications, the messages displayed on the Alert Box and the subjects and bodies of the emails sent by this module. Also variables are set in email template edition to make it easier for you. Ease of use: At the moment you install the module it's already working without even have to modify or configure anything, of course you can personalize it. Do you want to increase sales? 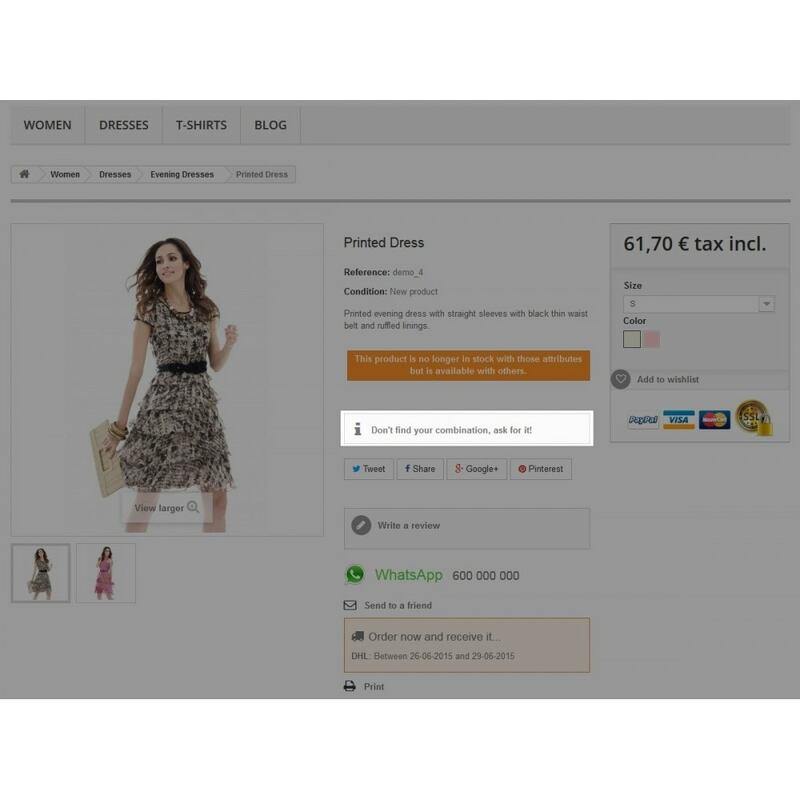 Recommended Products allows you to select products by ID, display them in the shopping cart, columns or product footer to increase your conversion rate. You are welcome to send us your thoughts, features requests and anything that may help up improve the module. 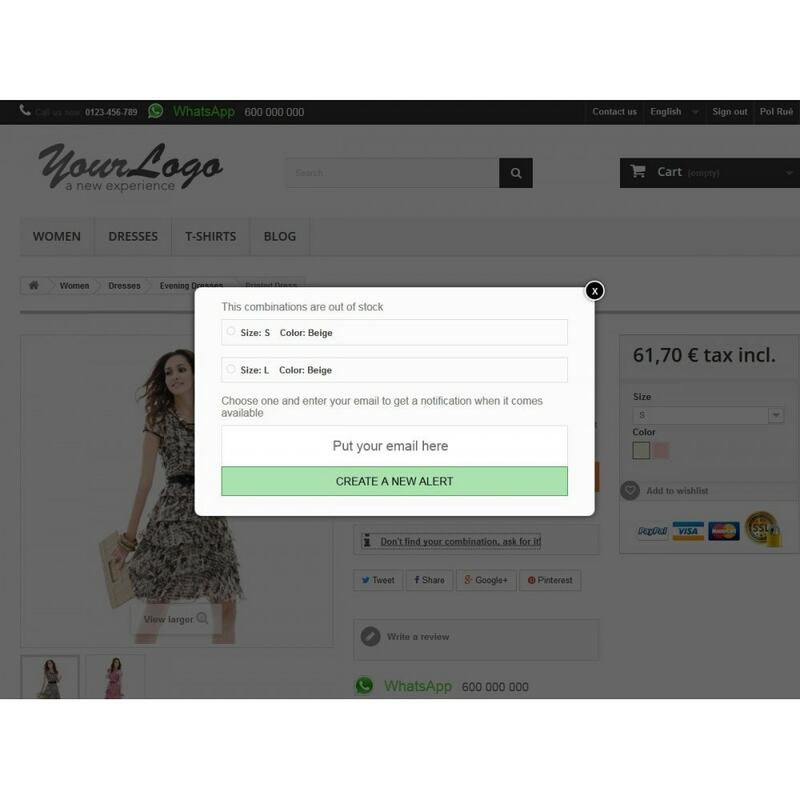 Customers will view the Product alert box inviting them to create an alert, keeping them in contact with you. And letting them know when a product they want has stock again. Enable it and check the basic configurations. By default the module copies the templates from the english language. 1.4.1 Improved PS 1.7 code for multiple combinations. Solo per Facebook. Il modulo più completo d'inseguimento delle conversioni ed eventi. Eventi (vendite, registri…) pubblici personalizzati e pubblicità dinamica di prodotto (DPA)... tutto in uno! Anche supporto per l'installazione e configurazione. Il modulo multi-video e multi-lingua più completo e flessibile per i video dei prodotti, con il quale potrai aggiungere materiale da YouTube o Vimeo.